It all started when my mom convinced me to try mixing cranberry juice into my orange juice. The tart flavor of the cranberry perfectly balances the sweetness of the orange. Cranberry orange juice is still my favorite drink, but it’s gone far beyond just juice now. I absolutely love the tartness of cranberries and how they can complement a sweet salad, baked good, or even soup so well. They’re amazing in these cranberry orange bites and in this strawberry spinach salad. 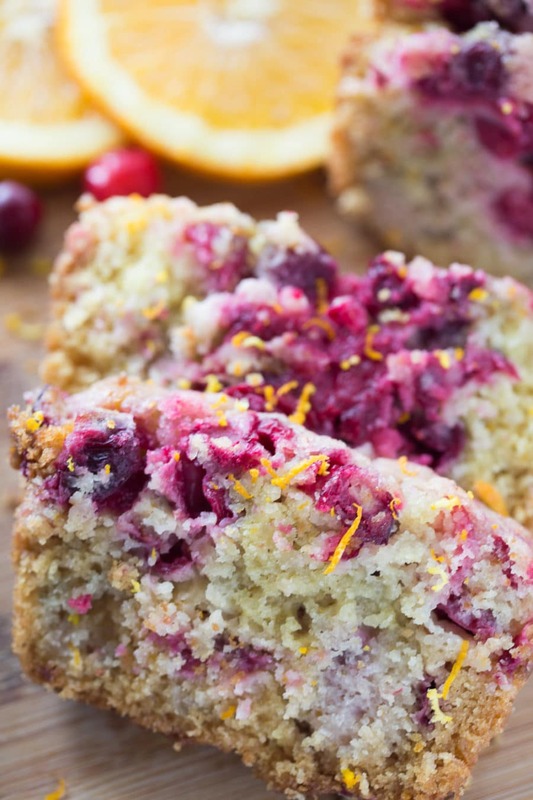 This cranberry orange bread recipe is actually one from one of my good friends Kristin. She made it for a baby shower we hosted together a few years ago, and I knew I had to have it. She so graciously shared it with me, and I’ve made this cranberry bread every year for the past eight years! The cranberry bread is fairly simple to make but does take a little bit of time because you start out by chopping all of the cranberries in half. But I’m getting ahead of myself, let’s start at the beginning. Chop your cranberries in half and mix with sugar. Measure out your dry ingredients and set aside. Measure out the wet ingredients. Pour into loaf pans that have been sprayed with non-stick spray and bake. Watch the cranberry orange bread video below to see how quickly you can put this cranberry orange bread together! Once the bread is done, serve sliced or just bite off chunks of the mini loaves like I do. No matter the way you slice it, it’s going to be delicious. 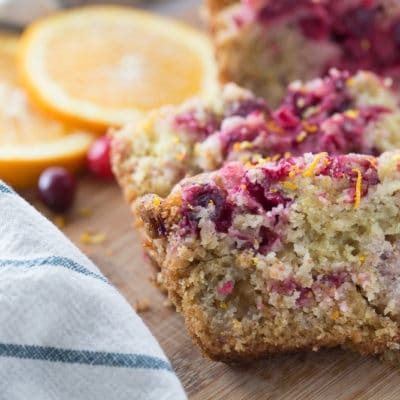 Here are a few tips and tricks for getting the best cranberry orange bread every time! Don’t substitute the oil for something healthier. 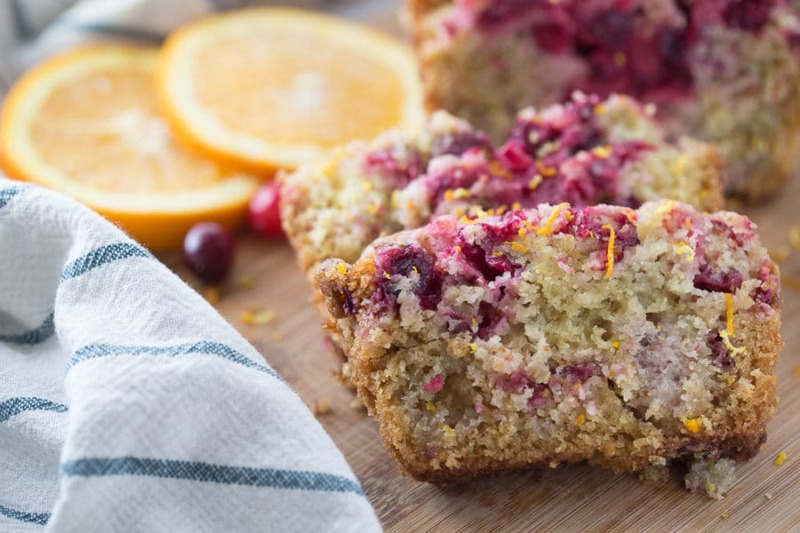 The oil is what makes this one of the most moist cranberry orange bread recipes ever. It’s moist and absolutely delicious. If you do feel the need to make a substitution, substitute it with another oil – not applesauce. Check the bread’s doneness with a knife. Every oven cooks differently, so when you think the bread might be done – stick a butter knife straight into the bread and pull it out. If it comes out clean, the bread is done. If it comes out covered in gooey batter, let it cook for a few more minutes. Let the cranberry bread cool before cutting. If you try to cut it while it’s still hot, it’ll likely crumble when you’re cutting the bread. It still tastes good crumbly but won’t hold together as well. If you just let it cool a little longer, the slices will stay together well. Since I shared this recipe over four years ago, I’ve had a ton of questions from people on making it. I’ve included answers to the most frequently asked questions below. If you have more questions, leave me a comment, and I’ll do my best to answer it as soon as I can! Where can you find cranberries all year long? 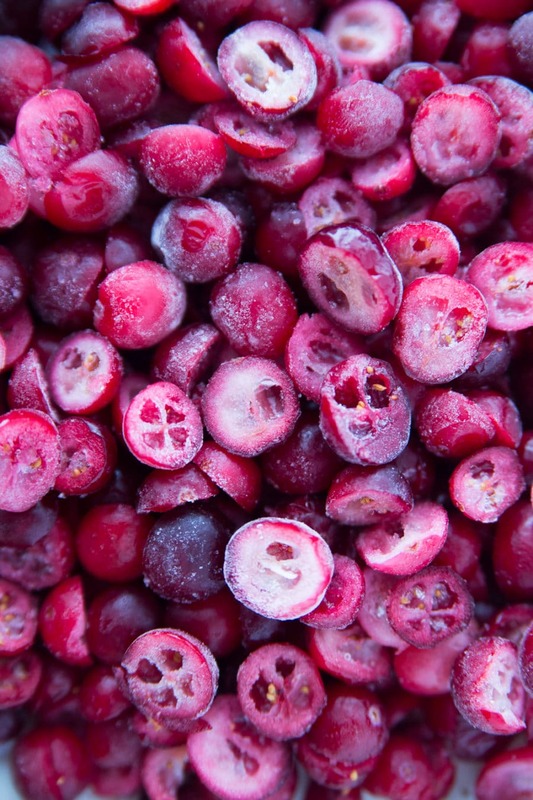 You can find frozen cranberries in grocery stores like Whole Foods on a daily basis. But if you think about it, purchase some fresh cranberries during cranberry season and freeze them to use all year long. Otherwise, I haven’t had a lot of luck finding them the rest of the year. Can I use dried cranberries or Craisins in this cranberry orange bread? Yes, you can use dried cranberries or Craisins in this bread recipe, but it is not going to taste the same. Dried cranberries are just not the same. They don’t carry the same amount of flavor, moisture, or tartness. If you’re totally out of luck and can’t find actual cranberries, they’ll work in a pinch but the bread will likely be a bit drier than normal. If you use Craisins or already sweetened dried cranberries, I’d skip the step where you sugar the cranberries or they’ll be way too sweet. I’d also recommend rehydrating them in either water or orange juice before putting them in the recipe. 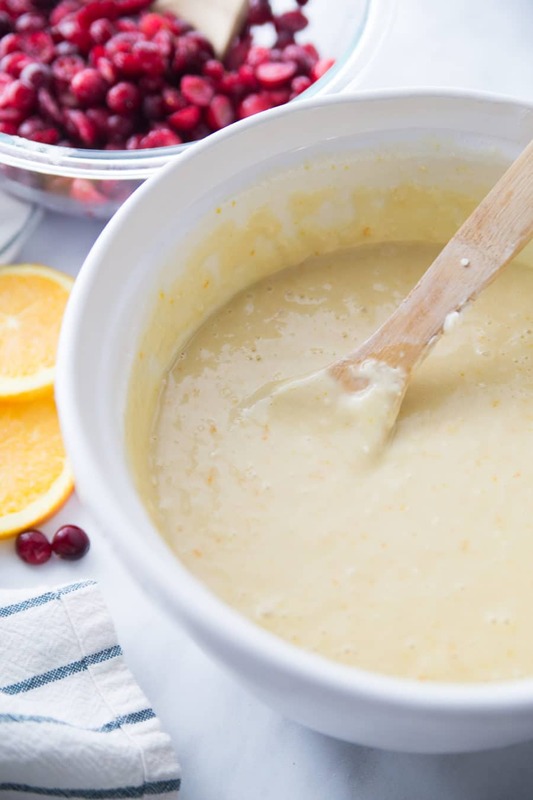 Will this cranberry orange bread recipe work without the orange zest? Yes, this bread recipe will work without the zest – however, the orange flavor may not be as strong. If you don’t have dried orange rind, you can definitely use fresh orange zest as well. And if you don’t have either and really want to make this bread, you can omit it – it just won’t have as strong of an orange flavor. Can I use frozen cranberries in cranberry bread? Yes, you can use frozen cranberries. Simply let them thaw before using them in this recipe. 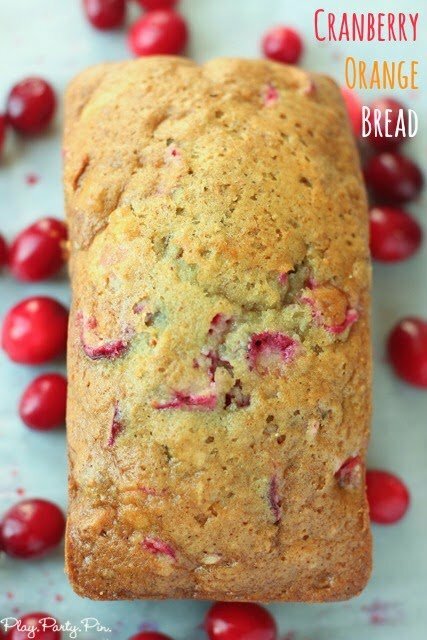 Frozen cranberries are a great way to make this bread when fresh cranberries aren’t readily available. Can I just pulse the cranberries instead of cutting them in half? 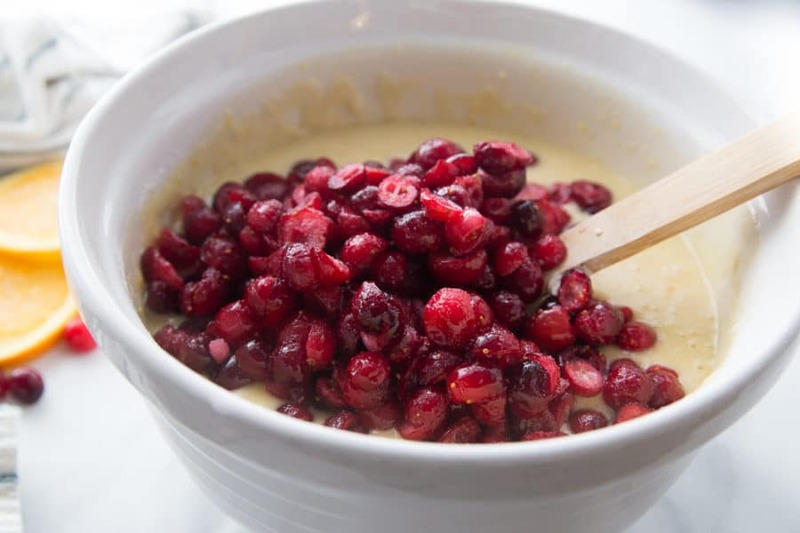 Technically you could just pulse the cranberries then add the sugar to them, but you may end up with tiny bits of cranberry and really big pieces of cranberry, which could change the consistency and taste of the bread. Does this make regular loaves or mini loaves? Or muffins? All of the above! This recipe typically makes 6-8 mini loaves depending on how full you fill the pan. It typically makes two full size loaves. And it typically makes 24 muffins. Just adjust the amount of time you cook the batter depending on what you’re making. How long does this cranberry orange bread keep? And can you freeze it? 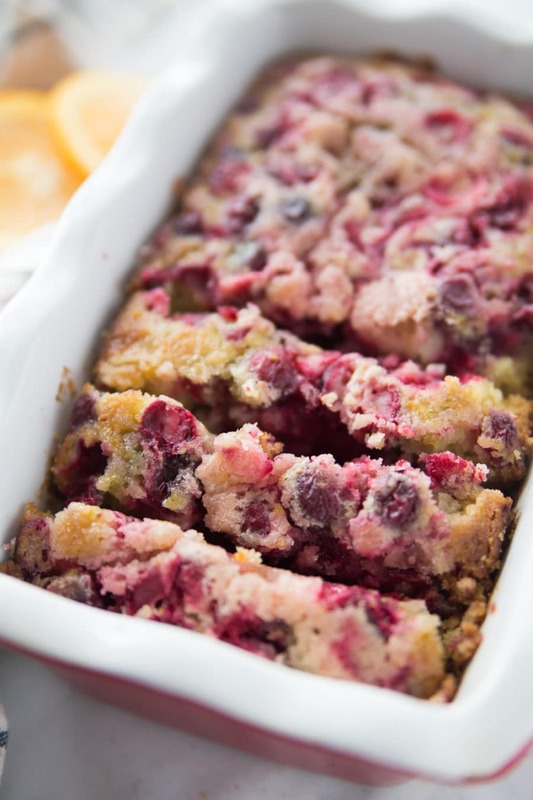 This cranberry orange bread keeps for up to a week or if frozen up to 3 months. Simply wrap and freeze wrapped in plastic and when you want to eat it – take it out and let it thaw before eating. The bread may not be quite as moist when thawed after being frozen, but it still tastes delicious! If you make this into mini cranberry orange bread loaves, these would make perfect holiday gifts for neighbors, friends, teachers, or really anyone. Just make sure if they don’t eat nuts to omit the nuts in the recipe! 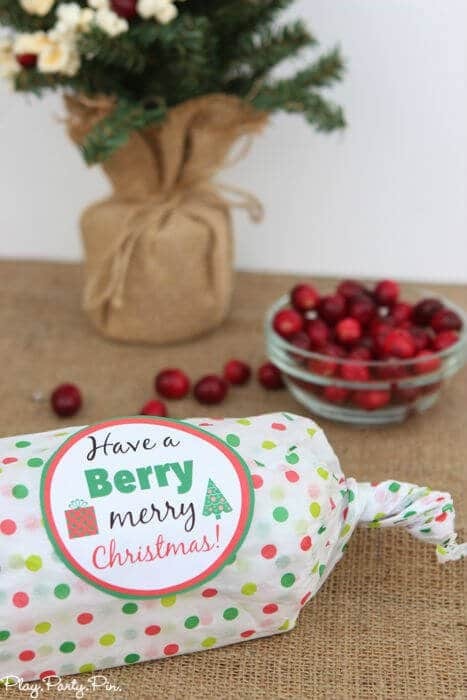 I’m all about corny gift tags so these all have a play on the word “cranberry” in the gift tags. Simply wrap up the bread in some sort of holiday food safe wrapping material, add one of these gift tags, and you’ve got a gift that anyone would love to receive! Enter your first name and email address in the form below to get the free printable gift tags. You will be immediately taken to a PDF form of the printables as well as receive an email with a link to the gift tags. If you cannot see the form below, click here to get to it. Just wondering if the mini loaf pans you bake in are ceramic or the give away tin type? Where do you get them?? I’ve done both. You can get the giveaway type online or typically at a local grocery store. I made this bread (two large loaves) last December and it was delicious. One loaf stuck to the bottom when I took it out of the pan. I did use cooking spray before I put the batter in. I ran a knife around the sides and removed the loaves from the pan after they cooled about 8-10 minutes. Should I let them cool longer before taking them out of the pan to avoid the sticking? Thank you for the helpful tips! Glad your family enjoyed it. This recipe was very tasty but the berries all went to the top. Should they be floured before I put them in the batter? Did you add sugar to them Robin? I’ve never had issues with them going to the top before, and I’ve never floured them, just sugared them per the recipe. I had my doubts. PERFECT! 9 mini loafs done to perfection in 45 minutes. Followed the recipe exactly. I’ll be making this again and again. I made this yesterday. I substituted the chopped pecans with bittersweet chocolate chips. Amazingly delicious. The recipe yielded 2 large loaves. I kept one and gave the other to my sister who loved it. The combination of orange cranberries and chocolate is a match made in heaven. I made this recipe yesterday and made mini loaves. This recipe is the best! So bright and fresh! I brought a loaf to my parent’s house and they loved the bread. My mom and I immediately began making another batch for her bridge ladies. Thanks! How many mini loaves does this make? It typically makes about eight mini loaves depending on how you fill them. If you read through the comments you can see how many mini loaves people got out of the recipe. Sorry the recipe didn’t work for you! Maybe try it again without adding the additional flour and see what happens. I’ll have to try a couple of different things and get back to you. I’ve never really had issues with the cranberries floating to the top before. Sorry! Can you sub out the egg for a flax egg and gluten free flour mix for the regular? I have no idea unfortunately but if you try it let me know! I made this with Namaste gluten free blend flour and used flax eggs and it turned out great! Its kinda chewy but that makes it yummy and thats how my banana bread turns out as well. Thank you for the recipe! Oh, and my family enjoyed when they were here for Christmas!! Very good bread. Living above 5500 feet, I usually have to alter baking recipes. Thought I’d try this one as is and it came out perfectly! Thank you for sharing this with me. This makes my heart so happy & all the work worth it. Have you ever tried all orange juice and no water? I haven’t! If you do it, let me know. I’ve never tried substituting lemon juice and zest but that will totally change the bread, especially since lemon is so much more sour than orange. I’d recommend just purchasing orange juice and orange zest or trying a totally different lemon bread recipe. I’m thinking the lemon would not complement the cranberry. The orange was the perfect balance. Many complements. I’m very critical and its perfect. This is absolutely moist and delicious. I followed the recipe to a T, which I believe is what you should do if you are going to rate a recipe. It made three full size loaves in loaf pans towards the narrower side. I will always use this recipe in the future. Doesn’t get any better! Thank you! I just made this yummy bread. One large loaf and 5 mini loaves. I used fresh cranberries and thought it might need glaze to cut down on tartness but everyone agreed it was perfect!! This recipe is certainly a keeper. Hands down, best recipe. I’ve made it for a few years now. The only thing I do different is sub the exact amount of butter for the oil. I also cream the butter and sugar, then eggs, and then add the wet and then dry ingredients. Tonight I made 18 large muffins. Perfect in 35 mins. Thank you for sharing. You’re awesome! Thanks for sharing your tips with everyone. This is the second year I’ve used this recipe for holiday baking. I love how moist this bread is. It may seem like over the top amounts of cranberries & nuts, however it’s worth every bite! Everyone I’ve given this bread to gives it rave reviews! This bread is awesome. I used only about three cups of cranberries because it looked like too much with four. My grown son even asked for the recipe!